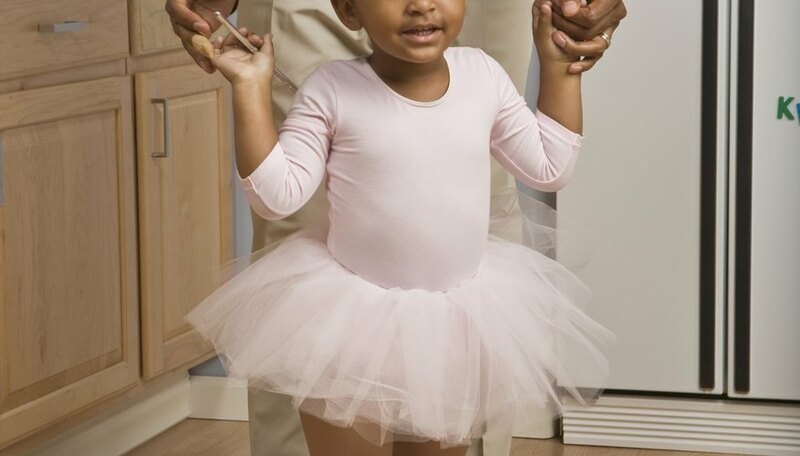 Toddler ballet classes introduce young children to the enjoyment of music and movement. The primary focuses of these classes include the development of body awareness and an improvement in balance and coordination. Instructors can utilize a variety of dance-themed games to help toddlers develop these early skills in a fun manner. Turn on the music and have your assistant or helper dance around the room with your group of toddlers. Pause the music and have the toddlers imitate your helper and freeze in place. At this age, do not eliminate the children who move from the game, but rather allow all toddlers to continue participating to keep the game fun for everyone. The freeze dance game helps to encourage the toddlers to think about their movements and develop movement control. Call out the names of animals and have each toddler move around the floor in the way she thinks that animal would move. Give the toddlers a moment to consider ways to imitate the animal and have your helper assist any child undecided in her movements. While not dance-oriented, this game encourages body awareness, thinking and creativity, which are all useful skills for beginner ballerinas. When enough time is available, allow each child to choose an animal to imitate for a little bit of extra fun. This game is an alternative to the traditional "Duck, Duck, Goose” game. Have the toddler group sit in a circle and choose one toddler to start the game. Begin by choosing a dance step or mode of movement, such as skipping and have the child perform this movement around the circle, saying “dancer, dancer," to each child. She then chooses one girl to become the “Star of the Show." The two of them race around the circle, using the chosen movement, and the first one back to the spot sits down. If the race confuses the toddlers, move around the circle with them to keep the game going. Repeat until everyone has a turn to be the “Star of the Show.” The game helps to reinforce different forms of movement. Divide the class into two groups for this “Red Rover “alternative. Have each group hold hands and stand in a line on opposite sides of the room. One group calls to the other, “Star dancer, star dancer, send “Jane” skipping over.” Each time, choose a different method of movement, such as galloping and tiptoeing. Rather than breaking through the chain of hands held together, have the star dancer join the group instead. Continue until each toddler has had a turn. The game allows you to reinforce different forms of movement.